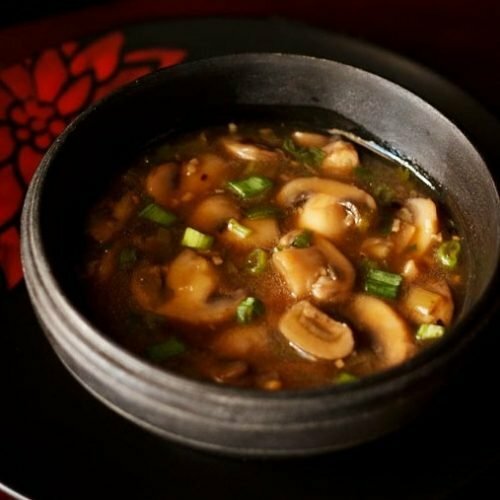 garlic mushroom gravy recipe - medium spicy sauce based dish made with white button mushrooms, garlic and spices. rinse or wipe dry the mushrooms. slice them and keep aside. chop the spring onions, garlic, ginger. crush the sichuan pepper and black pepper in a mortar-pestle. dissolve 1 tbsp corn starch with 2 tbsp water to a smooth paste. keep aside. heat 2 tbsp sesame oil in a pan or wok. add 2 tsp finely chopped garlic and 1 to 1.5 tsp finely chopped ginger. saute on a medium flame for half a minute. then add 3 tbsp chopped spring onion whites or finely chopped onion. saute for a minute. next add 1 to 2 tsp finely chopped celery. celery is optional and you can skip it. now add 1/2 tsp crushed black pepper or pepper powder and 2 sichuan pepper. stir and mix well with the rest of the mixture. now add sliced or chopped white button mushrooms (200 grams). saute the mushrooms on a medium flame. first the mushrooms would release a lot of water. continue to saute till all the water dries up and the mushrooms are cooked well. then add 1 tbsp naturally fermented soy sauce. for a gluten free version, use gluten free soy sauce. next add 2 tsp red chilli sauce or red chili paste. red chilli paste would make the sauce more spicy. you can add both the soy sauce and chilli sauce as per your taste. mix very well. pour 2/3 to 3/4 cup vegetable stock or water. add 1/4 to 1/2 tsp sugar. stir well. then add the corn starch paste. stir very well after you add the corn starch. bring the garlic mushroom sauce to a simmer on medium flame. then add salt. add less salt as soy sauce and chilli sauce already has salt in them. mix very well and continue to simmer till the garlic mushroom sauce thickens. switch off the flame and lastly add 2 to 3 tbsp spring onion greens, 1/2 tsp rice vinegar and 1 tsp rice wine (optional). give a quick stir and serve garlic mushroom gravy with veg fried rice, veg noodles, garlic fried rice, hakka noodles or veg chowmein.